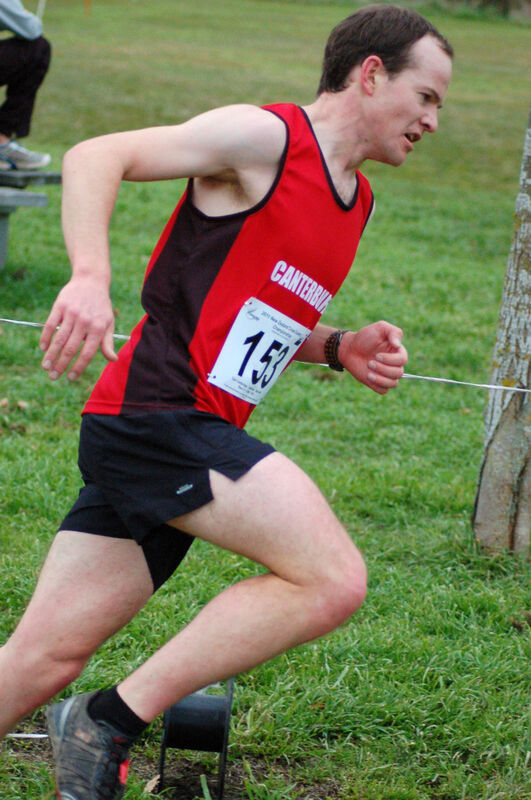 This weekend I was out running around in circles are Halswell Quarry this time wearing Red and Black for Canterbury at the NZ Cross Country Champs. It was pretty cold and that fed the apprehension a little bit…but as it was the NZ champs I was excited and eager to get out there and test myself against the fastest in the Country. The pace was horrendously quick to begin with and I found myself mid pack. Into the bottleneck at the trees I was strangled in the main pack until we moved out of the bushes and into the open again. Here I saw a huge gap up one side and hesitated than thought what the hell and took it! I stayed with this bunch up the hill then as we started to go down again, everyone switched the afterburners on. It seemed even though I was going full speed, I was still going backwards in the pack…. It was a cool feeling running down the hill and into the chicane with a bunch of very fast-moving people! Eventually I paid for running fast with the pack early on and I slowly began to slip backwards and felt very tense. I managed to ride this part of the race out and settled into a more manageable rhythm. At this point I began to gain ground on an Auckland guy and eventually passed him. Once past him another Aucklander managed to get in front of me however managed to stick with him. We managed to work together a bit and picked off several people as they began to slow a bit. Around the second last lap I was beginning to get some traction and almost got past him…but around the last lap he just took off, and I wasnt able to stick with him. It was hard work round the last lap and I pushed hard to put myself into 25th place. I was the 5th Canterbury runner about 3mins behind the winner, almost 2 mins faster than two weeks ago on the same course! I was fairly happy with my race however I never really felt comfortable like I did in the Canterbury Cross Country…I was also pleased to see that the competition is strong in the NZ cross-country world after all!